Spreadsheets and coffee weren’t cutting it anymore. I was supposed to be monitoring the social media performance of about 100 students in Cronkite News, which serves as the news department of Arizona PBS and one of the professional programs at Arizona State University’s Cronkite School. For months, I dutifully scanned every student’s Facebook page and Twitter account, copy/pasted data into neat rows and columns, then waved spreadsheets at everyone and squealed “ANALYTICS!! !” until I dropped. The whole production felt less like classroom innovation and more like TPS reports. Has CrowdTangle made my life easier? Yep. But it has also fundamentally changed the way students view social media. CrowdTangle, a free tool via Facebook, bills itself as “the easiest way to keep track of what’s happening on social media,” and it is. The platform has features that make social listening a breeze for any organization, but its most notable classroom superpower is shaving hours off grading. The Cronkite News syllabus requires students to use and grow Twitter accounts and Facebook pages over a semester. I had been monitoring growth via very lame spreadsheets: One sheet per platform, with a row for each student and columns for follower counts at regular intervals filled in the old-fashioned way. Please don’t ask how I was monitoring use; it involved manually checking student feeds and tabulating posts, and for my own sanity I cannot revisit those dark days. Here’s what I do now: At the start of each semester, I pull every student’s Facebook page and Twitter account into a CrowdTangle list, which takes about 10 minutes. Then, I check and share the list’s “Leaderboard” regularly. The Leaderboard tells me how productive each student is with an average daily post count; the students committed to growing and engaging their audiences (and, well, committed to earning a good grade) are not surprisingly often the most productive. But I cross-check students’ productivity with engagement data to ensure they’re not just posting to meet quota—because we all know posting lots of content that doesn’t get people to do anything is a losing proposition. I examine total interactions (defined by CrowdTangle as likes, comments and shares in Facebook, and likes and retweets in Twitter) alongside average daily posts and interaction rate to encourage a balance of quantity and quality. Finally, I monitor students’ audience growth using the Leaderboard’s followers and growth categories. The Leaderboard is dynamic, so I can sort students by any metric within any time period, and easily identify top-performing (and underperforming) students. Even better, the Leaderboards are public, so students can draw their own comparisons. A little healthy newsroom competition can be a very good thing. Growing an audience is hard, and CrowdTangle’s total transparency helps reluctant students see that it takes a combination of productivity and captivating content to make it happen. Like many newsrooms, we use a combination of historical and real-time analysis to assess our performance. Students love working on historical stuff like social content analyses and A/B tests, and it can be easy to let the real-time stuff slip. That’s why CrowdTangle’s “Viral Alerts” are a godsend. Viral alerts do the dirty work for you: CrowdTangle immediately surfaces social posts that rise above a “viral” benchmark you set yourself—and I put “viral” in quotes because, to you, “viral” may mean a tweet that’s retweeted 50 times or 500 times; to someone else, “viral” could mean a Facebook post with 25 times the account’s average interactions. We readjust our “viral” standards every semester: Right now, a tweet from our news account is viral if it overperforms three times above average, but we set it at eight times above average for our sports account. We tie our student list on CrowdTangle to our newsroom Slack account via webhook, and the posts that overperform pop into our #viral Slack channel as soon as they start to boom. Our students know to go share everything “viral,” because those posts have proven their worth. Students never have to guess what posts from their colleagues to share; they’re sharing the most engaging content, as determined by the audience. Journalism students see a lot red pens. And that’s great: Tough edits communicate the professional-level expectations they’ll face in their first jobs, and make their writing stronger. But do you know what also does that? Watching how the pros use social media in real time. 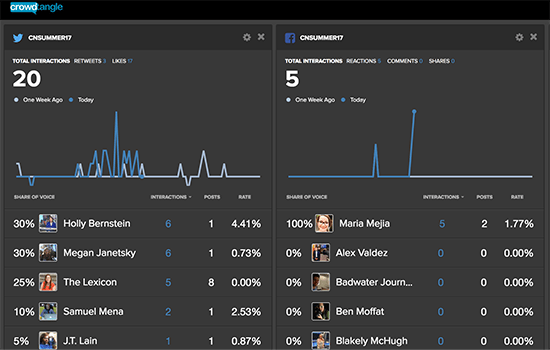 We take advantage of CrowdTangle’s already-populated user lists and follow the Arizona Local News list to track what every other newsroom in town is covering, and how their social content is resonating. 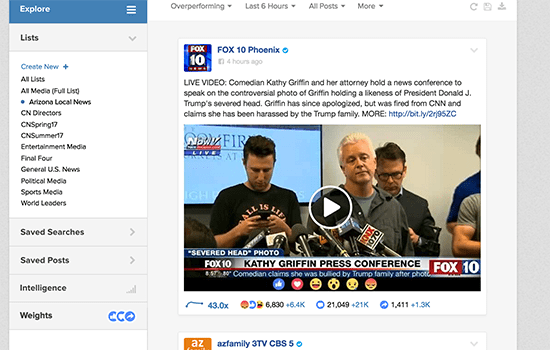 Right now, I can see that a video post from Phoenix’s FOX affiliate is overperforming at 43 times its page average, and that the CBS affiliate’s post on the very same story is outperforming at 32 times … and that those are the top-performing posts among the Arizona Local News list in the past six hours. 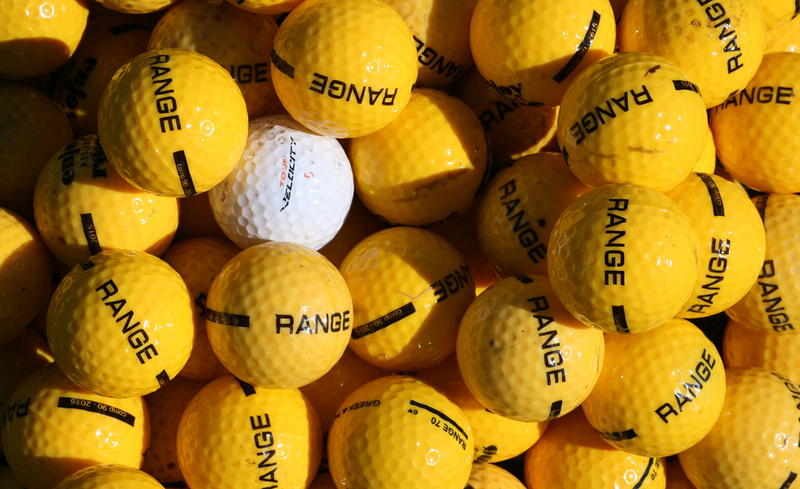 We ask, then: How can we replicate that success on our own accounts? What lessons can we take from these posts? And, just as I can see our own students in Leaderboard mode, I can do the same with our local news outlets. Students love to see when our newsroom is competing hard with our local newsrooms … and I like to see when we aren’t! Yes, I could add every single student to our newsroom’s multiple Facebook pages so they can dig around our Insights. But I’d rather not, and CrowdTangle ensures I don’t have to … and to be honest, the platform’s new-ish Intelligence tool visualizes growth and engagement so easily and elegantly, I wouldn’t want to. The Intelligence portal lets users measure interactions, post count and follower growth for any social account—yours or anyone else’s—and measure against up to four competitors, all across any date range. Students see not only basic metrics like average interactions and follower growth rates, but also visualize how post types drive engagement spikes. Suggest to a student that they should create a digital video to tease a story because video earns a lot of Facebook engagement and they might consider it. Share the Intelligence graph that shows native video was responsible for giant interaction spikes, and they’ll actually go post a video. CrowdTangle’s pretty nifty Link Checker Chrome extension helps answer those. Once you’ve installed it, you can visit any URL and quickly eyeball its performance across Facebook, Twitter, Pinterest, Reddit, Instagram and LinkedIn. The tool unveils how many times the link has been shared, which specific accounts have shared it, how many followers each of those accounts has, and how many social interactions each account is responsible for. We recently ran a story about local Muslim people’s desire to have more religiously inclusive dining options and beauty services, and shared it several times in Facebook and Twitter; it was one of our site’s most-visited pages in the past month. However, the Link Checker extension tells us that our social campaign wasn’t what made the impact: CAIR, the Muslim advocacy group, had shared the story on its social accounts, and those shares earned the most reach and interactions. 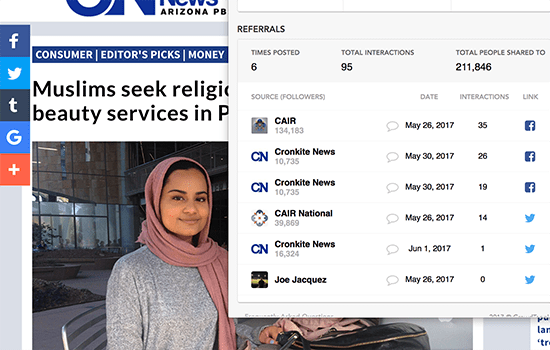 We can even click directly into CAIR’s social posts to see exactly how our link was shared, and learn from that success. Has CrowdTangle made my life easier? Yep. But it has also fundamentally changed the way students view social media: They’re able to better understand their own performance and impact in the social space, but also demystify the relationships between content and their social accounts, our newsroom accounts and our audience’s accounts. Now that’s classroom innovation. Jessica Pucci is a the Ethics and Excellence Professor of Practice at Arizona State University’s Walter Cronkite School of Journalism & Mass Communication, where she teaches engagement and analytics in the classroom, within Cronkite News and across the school’s new Digital Audiences curriculum. Follow her on Twitter, Facebook and Instagram.